I have been trying to introduce Meatless Monday into our life for, like, ever. I have made recipes for Meatless Monday and Mr. B runs out and grabs a burger. I joke that he is all “meat and potatoes” but it’s not really a joke when its true, right? Sounds kind of like a challenge, right? A challenge to come with a Meatless Monday dish that will please even my meat-lovin’ husband. 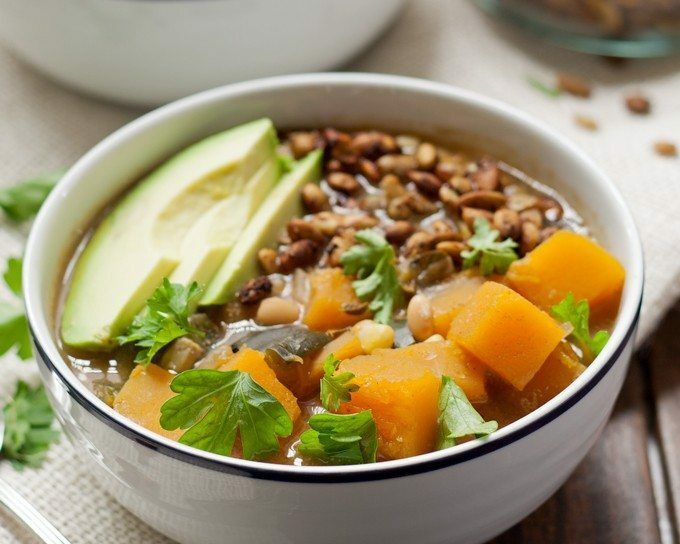 Next time we are watching football on a Monday night, we are going to make it Meatless Monday Night with a pot of this dairy free white bean butternut squash chili. Mr. B. challenged me at the same time as Silk challenged me to sideline meat for football season. And there is no reason you can’t have delicious dairy free, meat free food and enjoy the big game! I went to my local farmer’s market looking for some veggie-based ideas and came upon a stand with butternut squash and poblano peppers. I knew immediately that they needed to put into a chili together. This chili is super easy to make – the most difficult part is chopping up the butternut squash. If you have never cooked with butternut squash, don’t be deterred. Get the strongest vegetable peeler you own, peel away all of the skin (if there are green lines then you need to keep peeling) until the vibrant orange squash is revealed. Then take a butcher knife and slice the squash in half length-wise. Scoop out the seeds and then you can chop it up. A little brute force may be necessary but its totally worth it. Before I start messing with the butternut squash, I put the poblano peppers in the oven for a little bit to roast them. Roasted poblano peppers = love. If the skin from the peppers blisters, just peel it off and discard. After the peppers are roasted, its very easy to deseed and chop them. A big soup pot or dutch oven is needed for all your ingredients and a little time. Imagine the looks on your tailgating guests’ faces when they find out that delicious smell coming out of your kitchen is a pot of dairy-free, meat-free chili? I suggest not even telling them – it will be our little secret. We garnish with avocado, fresh cilantro and homemade spiced pepitas so keep those handy too! Visit the Silk Sideline Meat Website for more delicious recipes and a chance to win a giveaway! 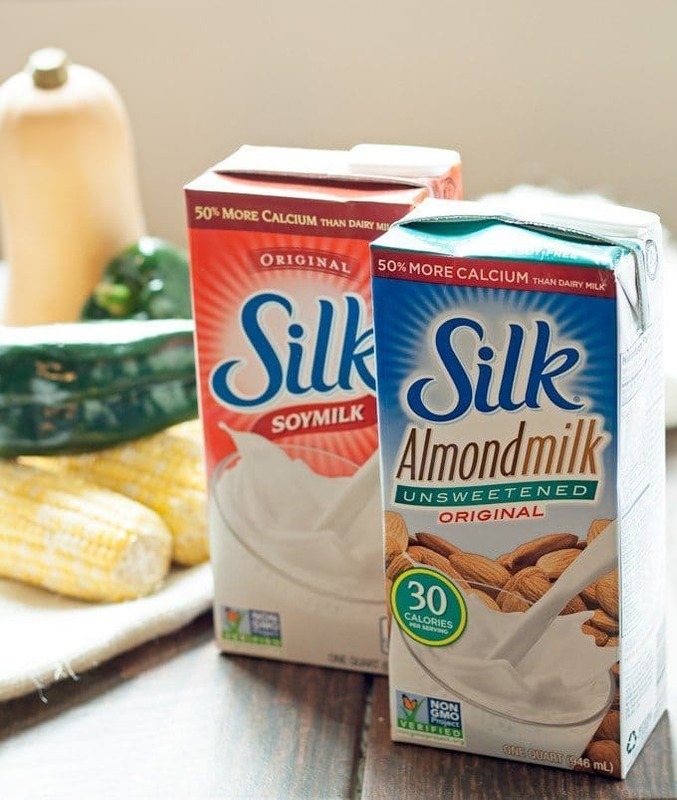 If you’re ready to start cooking, use this store locater to find Silk near you! 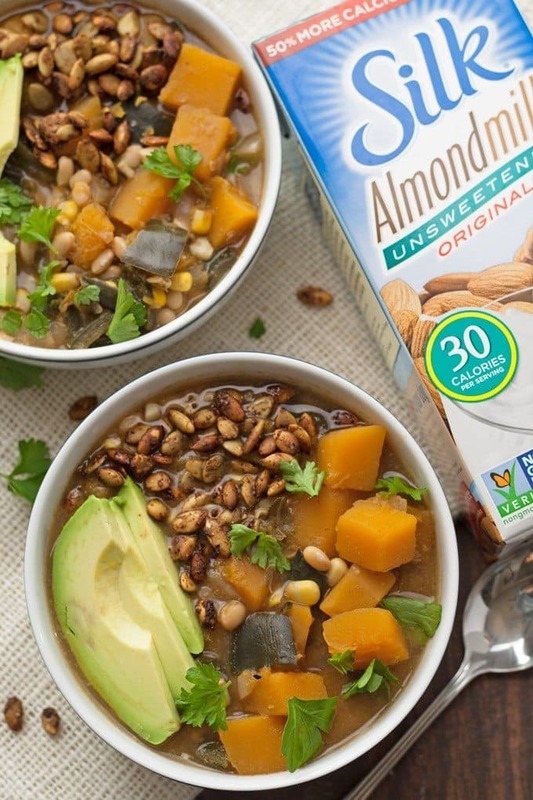 It's time to change up Meatless Mondays with this dairy free white bean butternut squash chili! Your tailgating parties will never be the same. Pre-heat oven to 425 degrees. When oven is warm, put whole poblano peppers on a pan and in the oven for 10-15 minutes or until the skin starts to blister. While the poblano peppers are roasting, peel and cut your butternut squash into large 1 inch chunks. You should have approximately 4 cups cubed butternut squash. When the peppers are done roasting, remove them from the oven. Allow them to cool, then remove the skin, stem and seeds. Cut into 1 inch chunks. Heat the olive oil in a large soup pot over medium heat. When the olive oil is hot, add the onions and garlic, sautéing until translucent. Then add the butternut squash, poblano peppers, and corn. Stir and allow to cook for 5 minutes. Then add the vegetable broth, chili powder and cumin. Stir well and allow to simmer for 30 minutes or until the squash is tender. Add the Silk Unsweetened Almond Milk and the small white beans. Turn heat to medium-high and cook for an additional 5 minutes. Season to taste with salt and pepper. Garnish with avocado, cilantro, and pepitas. I love these Meatless Monday meals! 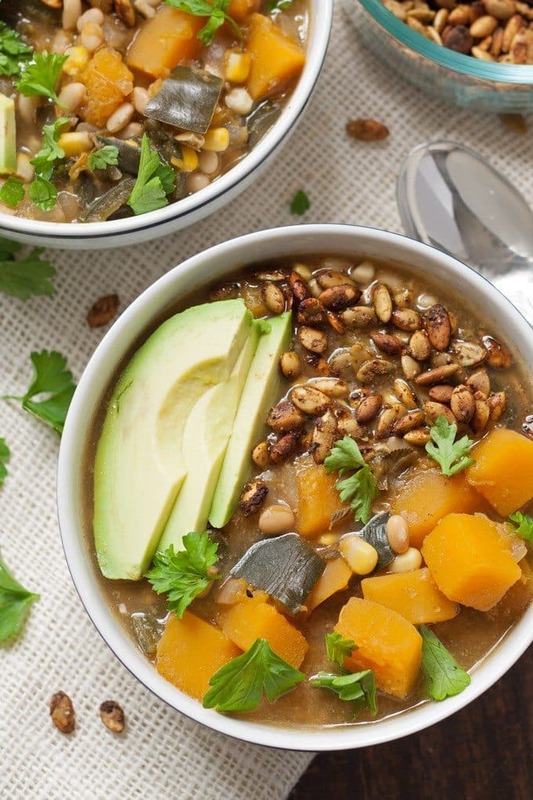 The butternut squash in this soup looks to die for! This is my kind of soup–I bet this would be a great option for tailgating! What a wonderful recipe. 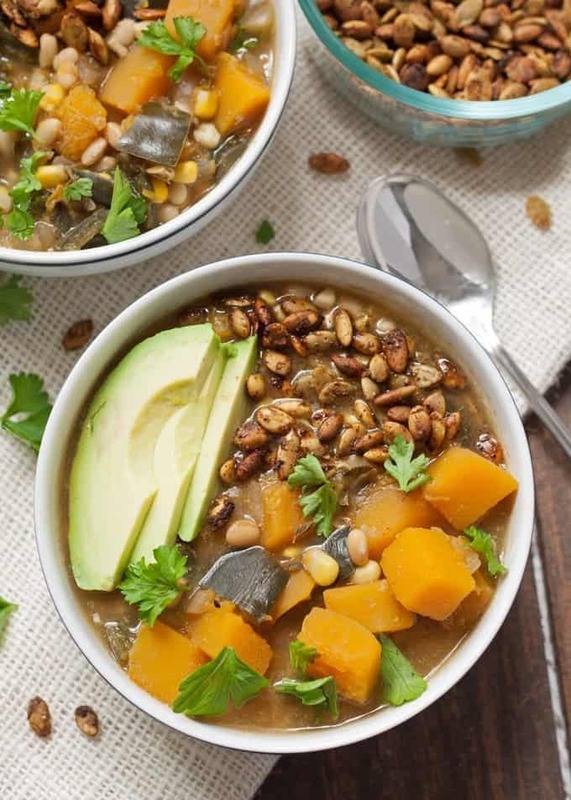 I love the squash with the smoky spicy poblano flavor. Then you went and topped it off with an avocado.- love and sharing! Loving this unique take on butternut squash. 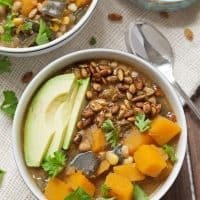 I love a good hearty soup for fall! This chili looks wonderful! Love the roasted poblanos in this! 🙂 And bonus for being healthy too. The extra step of roasting the poblanos must add so much flavor! What a perfect, healthy bowl of chili. It definitely does – thank you! I’ve been going ape for pepita seeds lately. I make sure to buy them every week at the grocery store, so I’m excited to see that you’ve added them to this lovely chili! Looks delicious! I <3 pepita seeds - I think I am going to do a separate post with the spice combo I came up with for this chili. Tis the season for pepita, right? Looks amazing! You would never miss the meat with this, so hearty and perfect comfort food! Thanks Erin! My husband had no idea it was meat-free until I told him! This looks absolutely amazing! 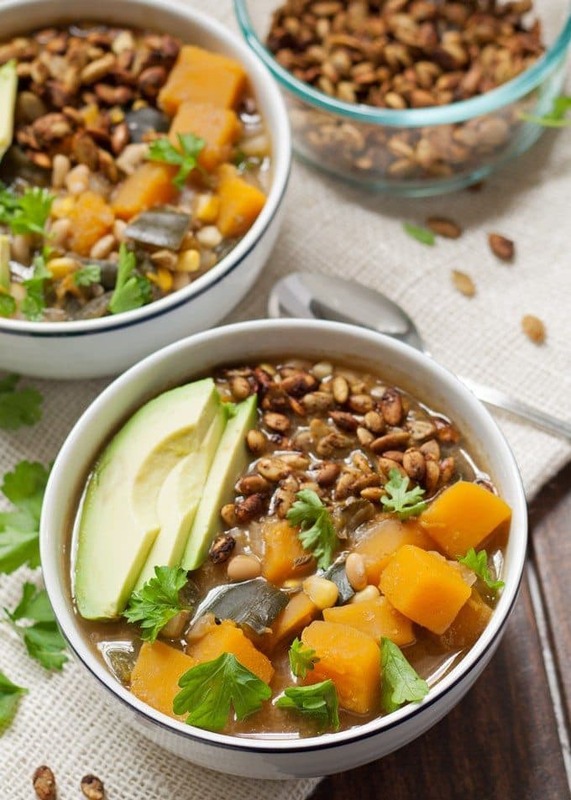 I love butternut squash and can’t wait to make this chili! Thanks Sarah – I hope you enjoy it! I love butternut squash and this chili looks like a delicious way to enjoy it! This sounds so good with the white beans and poblanos! Wow. This looks so delicious. SO much flavor! Thank you Robyn!! You just made my day! This sounds so great! YUMMY! Yum, this looks so good! I’ve been looking for some new recipes to change up my routine! Thanks for sharing at Merry Monday, hope to see you again next week! Pinned, yummed and stumbled and shared! This looks amazingly good! Thanks for sharing at the party. I hope to see you again soon. Pinned & shared. I love white bean chilies, your dairy free version with those roasted poblanos, sounds delicious! Thanks for sharing at What’d You Do This Weekend? !